Today was a day of celebration in Belgium in more ways than one. 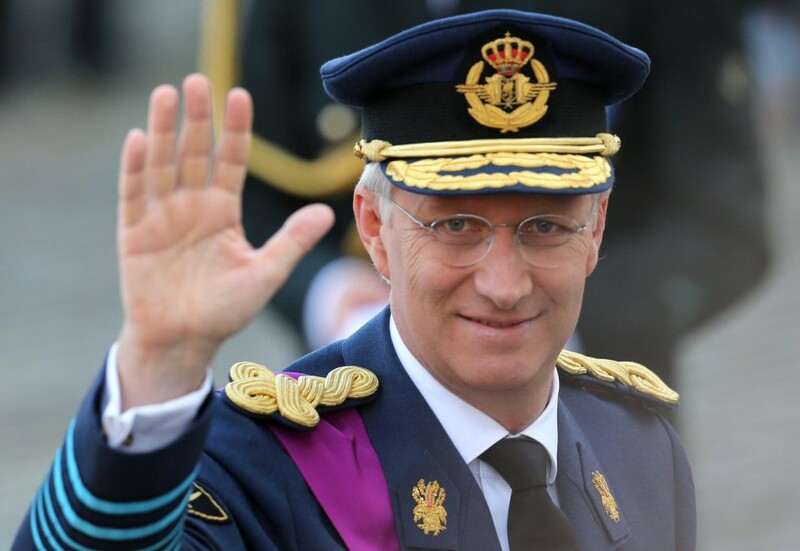 The former King, Albert II, in fact abdicated this morning, on Belgium's National Day, in favour of his eldest son, Prince Philippe. 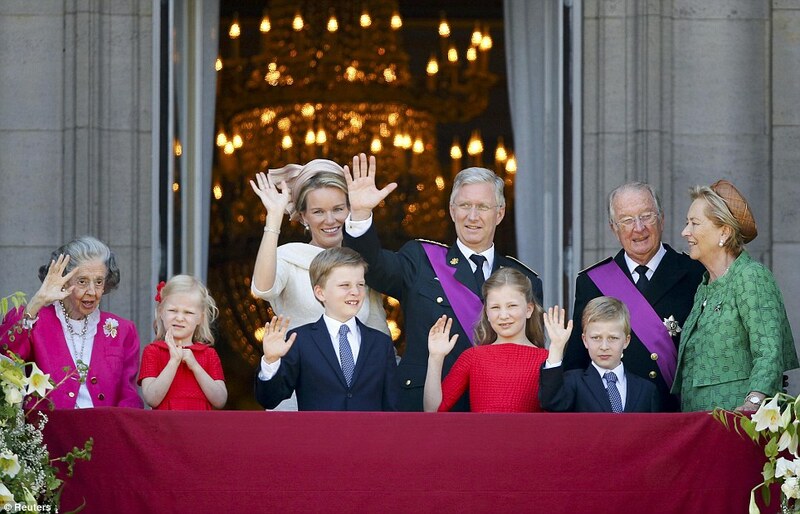 So we now have a brand new Belgian King and Queen, Philippe and Mathilde. Mathilde used to be one of my favourite European princesses, in terms of style, so I'm much looking forward to her new royal role. 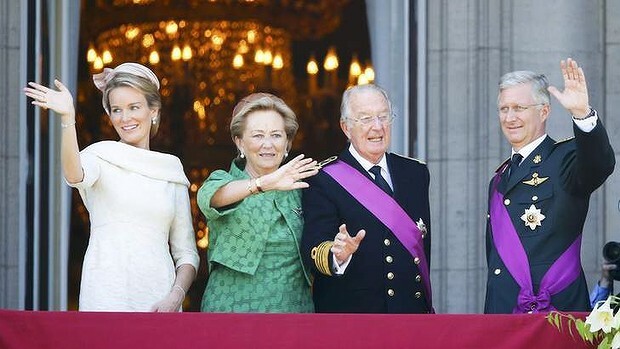 The extended Belgian Royal family, with Queen Fabiola on the left and the former royal couple, King Albert II and Queen Paola, on the right. A rather stiff-looking balcony kiss. The former King and Queen waving to the crowd. 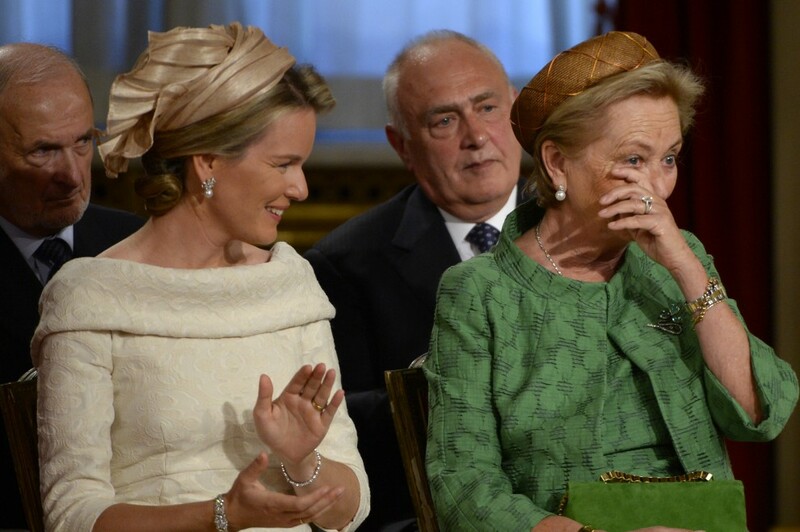 An emotional moment for Queen Paola. 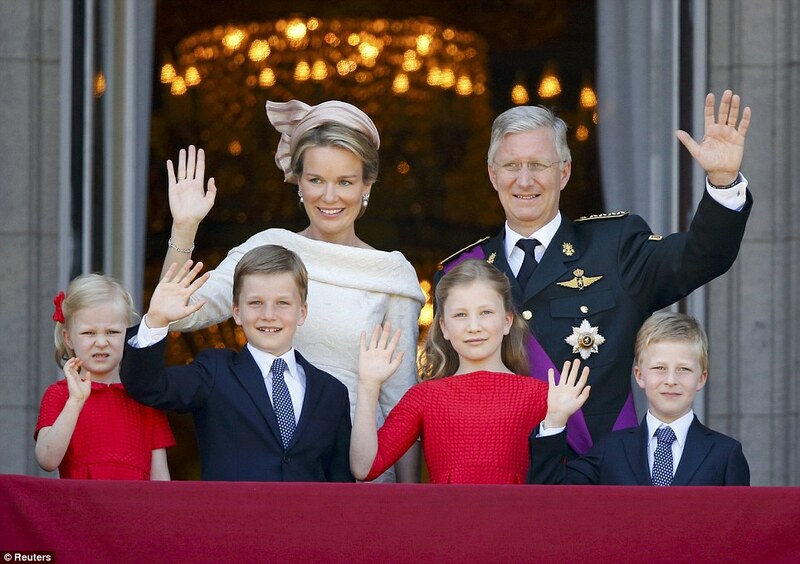 I must say on this particular occasion I wasn't a huge fan of Princess Mathilde's choice of headwear. 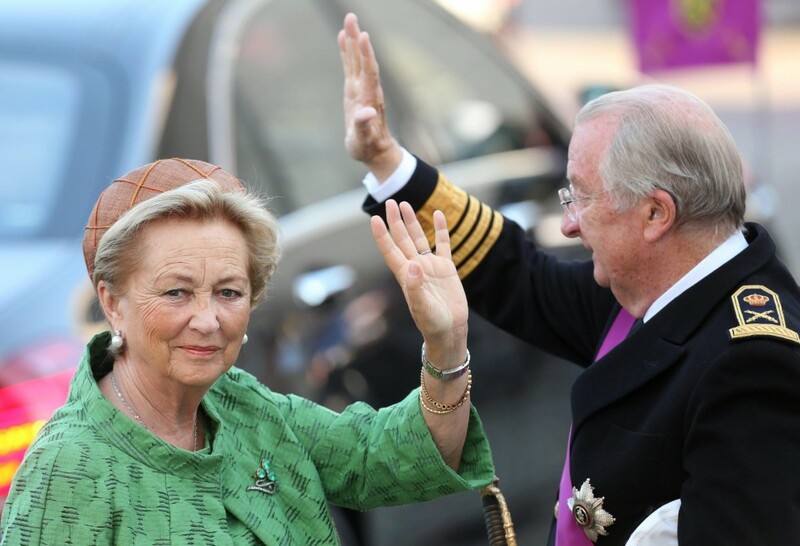 She wore an iridescent beige silk creation by Belgian milliner (and Belgian Royal Warrant holder) Fabienne Delvigne, named "Envolée", and indeed, as the name suggests, the hat's shape and sense of movement are reminiscent of a bird about to fly away. But I find the hat to be too pale, in certain pictures in looks almost as if it's blending with her own hair colour, a bit...blah! We've seen much prettier Delvigne creations gracing Princess Mathilde's head in the past, most notably at the recent Dutch coronation, and while I understand that a wide brimmed hat like the one she sported on that occasion wouldn't have been suitable for today's events, I feel something more striking than this quartz-coloured sort-of turban could have been provided. 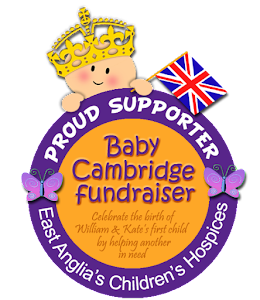 I don't know, I was hoping for something lightweight and flowery, maybe adorned with Swarovski crystals, in a nod to the Belgian tradition for flower carpets! Back view of the turban-shaped atrocity. 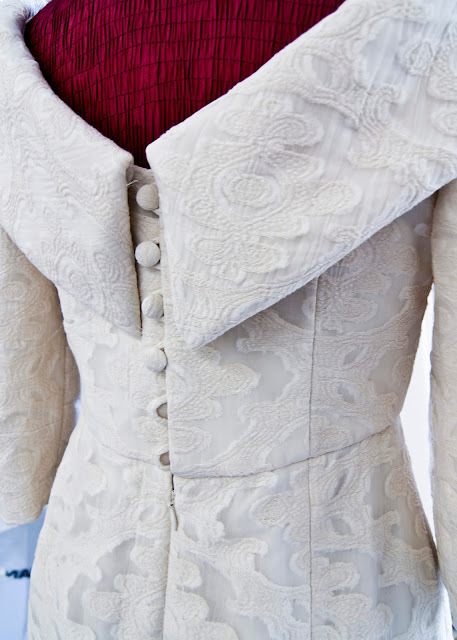 OK, having provided my totally irrelevant opinion on this matter, I'll go on to say that I found Princess Mathilde's dress very pretty: it was a dress by Belgian couturier Natan, white with a brocade design and elegant detail to add interest at the back. I'll leave you with a charming photo of the new royal couple - and what are your views on today's royal fashion choices, are they as strong as mine or did you like the hat? 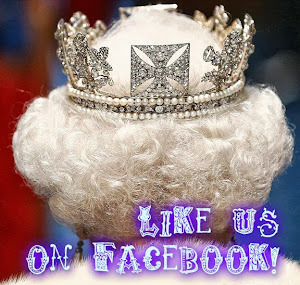 Be sure to leave a comment below and let me know!